The holidays are a series of negotiations. Where do we spend the holiday? Who will join us? Whose family recipe will be used for dinner? Most importantly, who will be present? Will my feelings be hurt? Will I hurt feelings? And, why is so and so always so loud or, alternatively, so quiet? So, what tips will help you through the holidays? It’s the stuff that mediators and hostage negotiators do every day. Listen. Really listen. Actively listen. Or, as one former F.B.I. hostage negotiator put it in a recent New York Times article entitled “Crisis Negotiators Give Thanksgiving Tips”, “Just shut up and listen.” When people talk they give lots of information. Often times just keeping people talking is the trick. But, listening is a sometimes rusty skill in this day and age of electronic communications. We respond quickly to emails and messages. We listen to respond rather than to learn. If you want to improve your holiday, think about listening in a new way. Listen to learn. It’s actually a lot less work than responding, and you will learn a great deal. You will learn what mediators and hostage negotiators need to know — what are your true interests, fears, needs I always feel a little like I am not working when I simply sit and listen during mediation, but then I realize it’s productive. The same goes for the pre-holiday negotiations and the holiday table discussions. Before the holiday, listen to what others want and need (or even fear) in their holiday. 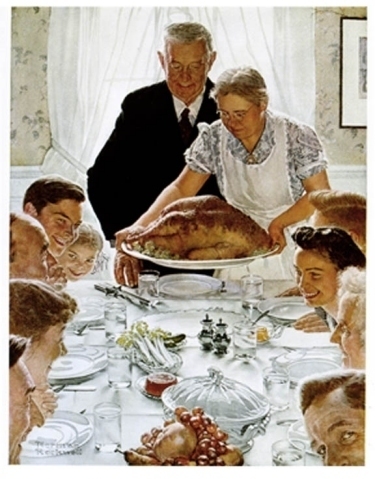 Maybe they prefer a small gathering whereas you were hoping for the big Norman Rockwell holiday table. Maybe they have different and or new people they are seeking to please. The holidays can be enjoyable if you just shut up and listen. This entry was posted in Emotion Recognition, Emotions, Listen, mediation and tagged crisis, emotion, fear, holiday, listen, mediation, Negotiation, thanksgiving, tips, want. Bookmark the permalink.